The Spice must flow. Or not. A few days ago, the UK-based Stratospheric Particle Injection for Climate Engineering project, or “SPICE,” was asked to delay its initial step in a project aimed at cooling the Earth’s climate. Essentially, its ultimate aim is to one day mimic the effects of volcanic eruptions through the large-scale spraying of climate-cooling sulphate particles into the stratosphere. The first step is to use water particles sprayed from a balloon, but that will have to wait. 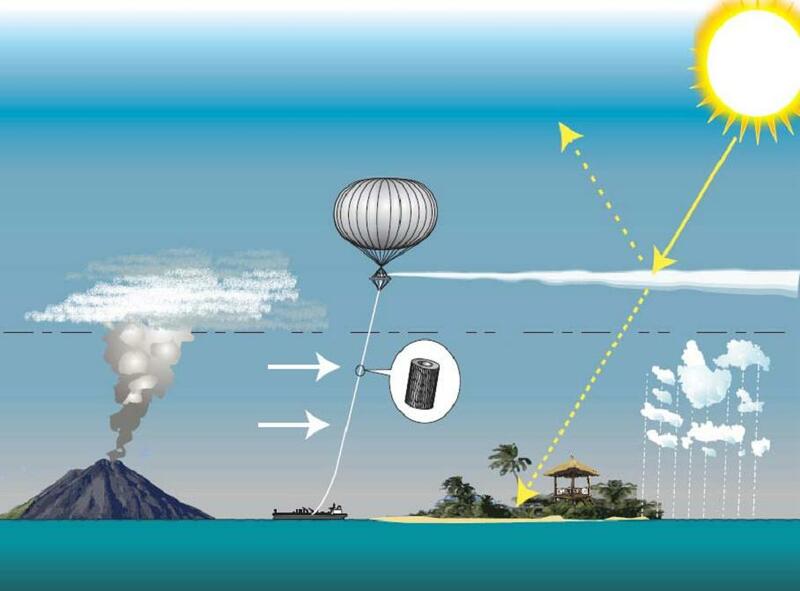 The project is embedded in a much larger debate regarding the merits and demerits of geo-engineering solutions to climate change. Those in favor are of two minds. Some argue that these technological fixes can buy us time while the world plods towards an international political solution, while others, more fatalistically, believe geo-engineering solutions are inevitable and research should begin sooner rather than later. Those on the other side of the debate have a number of objections. First, they contend that such geo-engineering projects, even in their planning stages, are a distraction from the urgent need to reduce greenhouse gas emissions worldwide. Second, there are fears that such unilateral actions exist in a grey area of ethics and international law, which should be better clarified before moving forward, if at all (indeed, this is the basis for a United Nations moratorium on geo-engineering). And finally, there are serious and legitimate questions regarding the potential unintended consequences of such ‘solutions’ on climate systems, such as a concern that sulfate clouds might significantly alter weather patterns and cause droughts. This final concern brings us to Thomas Midgley. Midgley accidentally became the father of geo-engineering, putting into motion changes that continue to influence our climate and our approach to problem-solving. In 1921, Midgley helped stop engines from “knocking” by adding lead to gasoline. This was good for the engines, though highly toxic to humans and the environment. Advocates called for regulation, but catalytic converters ultimately came to the rescue. The converters couldn’t handle the lead, and so the lead was dropped. But the story doesn’t end there. In 1928, after recovering from lead poisoning, Midgley went on to help solve the refrigeration problem presented by the highly flammable and/or toxic refrigerants of the day – ammonia, sulfur dioxide, methyl chloride and butane – and he worked his way through the periodic table to discover that CFCs (chloroflourocarbons) were neither flammable nor toxic – hence, the advent of Freon. Midgley did not live long enough to see Mario Molina and Sherwood Rowland win a Nobel Prize for discovering CFCs were responsible for the hole in the ozone layer. Fortunately, replacements for CFCs were in the pipeline and helped with the transition from CFCs to HCFCs (hydrochloroflourocarbons,) and finally, to the ozone-friendly HFCs (hydroflourocarbons). Midgley’s story ends there, but his legacy continues. HFCs, like their predecessors, were a solution with a new problem embedded within. It turns out that HFCs are what is called an extreme, short-lived climate forcer, or a “super greenhouse gas.” Today, more climate-friendly alternatives to HFCs are being developed, but HFC use continues to grow dramatically, and the political will to eliminate them has not yet fully materialized. Thomas Midgley started a geo-engineering treadmill: a brilliant technological solution created unintended consequences, policies and regulations were developed to address the problem, those policies were aided by a new technological fix that, over time, led to a set of its own unintended consequences. What does this mean for the geo-engineering solutions being offered to mitigate and adapt to climate change? Tread carefully. By Francesco Femia & Caitlin Werrell in CFC, drought, geo-engineering, greenhouse gas emissions, HFC, refrigerant, short-lived forcers on October 3, 2011 .